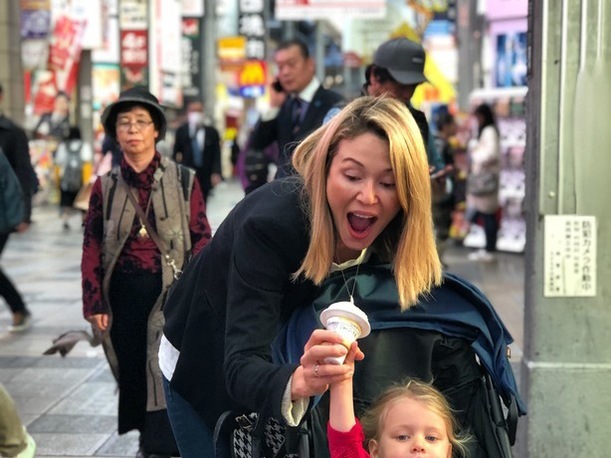 Japan is a fantastic holiday for the whole tribe and one of the top family-friendly travel destinations worldwide. 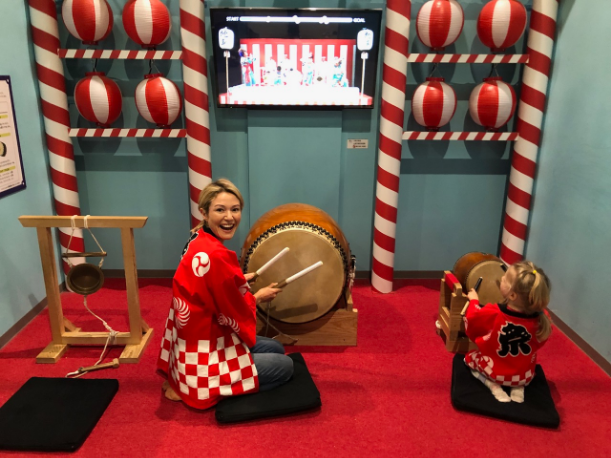 Sally Stanton shares her top tips for tribes thinking of visiting Japan with kids. Japan is an incredible country filled to the brim with new experiences, even for the best-traveled globe-trotter. It’s a captivating blend of highly respected tradition and culture with modern, high-tech, wacky, out of this world living. 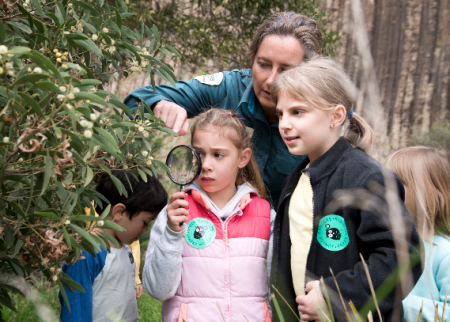 So it’s no wonder it’s long been a favourite travel destination for Aussies, but did you know it’s also one of the most kid-friendly holidays you could have? Everywhere you go is calling out for kids, even if it’s not for kids! The Japanese have a love for the fantastical world of kitsch and cute or as you may have heard ‘kawaii’! I can definitely attest to this because I’m half Japanese and my love of Hello Kitty still stands strong! Their Disney game is on point! Of course, there’s the theme parks, Disneyland and Disney Sea and pretty much every region has a Disney character donning the local logo or slogan. 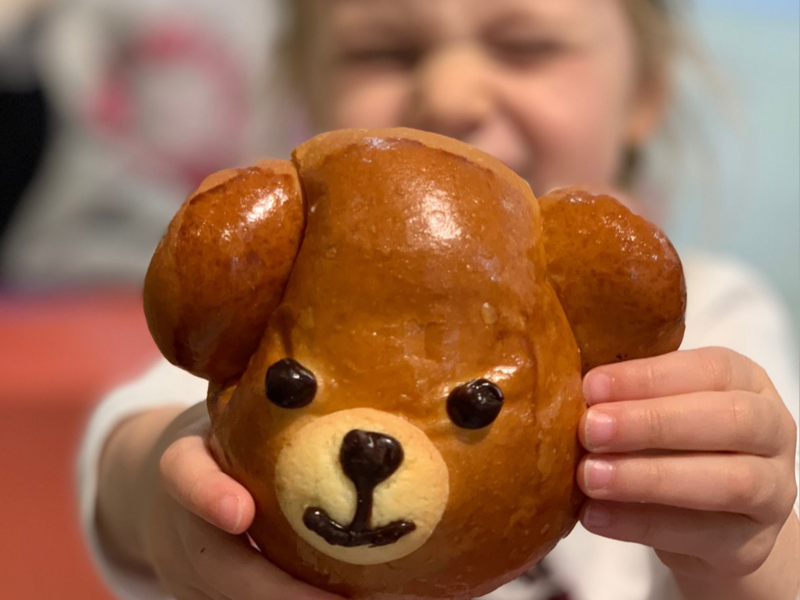 Then there are fun cartoon characters jumping out of cafes, themed meals for kids with cute cutlery and teddy bear shaped bread. The coolest playgrounds you’ve ever come across, electronic toilets, which are fun for all ages, giant ice creams dotted on every corner and of course in the big cities, bright neon lights illuminating the sky. We arrived in Tokyo Haneda airport at 5am and decided to take a domestic flight to Osaka. This meant we avoided peak hour traffic and trains, paying for a hotel to only check-in that morning, or having to waste time outdoors in the cold as not much is open in Tokyo until 10 or 11am! Not even Starbucks! After we transferred by shuttle to the domestic terminal, played in the kids’ zone and ate yummy Japanese cartoon cookies we were on a flight by 9am, this sounds like a long wait but it really was a good amount of time with a small child. A top tip when flying out of Haneda airport, ask to sit on the Mt Fuji side of the aircraft if the weather’s working in your favour you’ll score a priceless view of the iconic Fuji-San! We arrived at Osaka’s Itami Airport and took the limousine bus to JR Namba station approximately 30mins away and it was just us on board! Osaka is a big city, but not overwhelmingly so. Still, for accommodation with kids, pick your pockets. I like the Namba district as there’s a major train station that connects you directly to the airport and gets you to most areas of the city with little hassle. We also managed to find affordable serviced apartments in Namba, which are usually hard to come by. We stayed at the Fraser Residence Nankai. Opposite our hotel we had an eight level department store with a rooftop garden on every level. There is a kids play area on the very top and luckily for us a Christmas light display was held every night. My daughter LOVED it, chasing light projected snowflakes up and down the walls. She honestly thought it was Elsa’s castle. The world-renowned Luke’s Lobster Van was set up downstairs and a food and saké market just around the corner, so, cheap and cheerful dining options are at your fingertips. Finding food in Osaka is not a challenge, it’s the street food capital of Japan. If your kids are struggling to eat the local cuisine, the top level of most malls are full of international restaurants. A huge TOYS R US is still open in Namba located right next to the night food markets. So while waiting for your dinner you can go nuts in this epic toy store. They also sell nappies and baby food here which you surprisingly won’t find in city supermarkets or chemists so make sure you stock up. Takashimaya department store, also in Namba is home to one of the best-kept secrets in Japan, the depachika, a marvellous underground food hall. Okay so it’s no secret to the locals, but most tourists would have no idea what a treasure trove of culinary delights are hidden below them as they walk the footpath. We spent a lot of time roaming around ogling the treats and buying most of our meals here. And when Miss three was over it we’d go straight up to the children’s department on the 6th Floor, where there’s a little playground for tiny tots to burn energy. 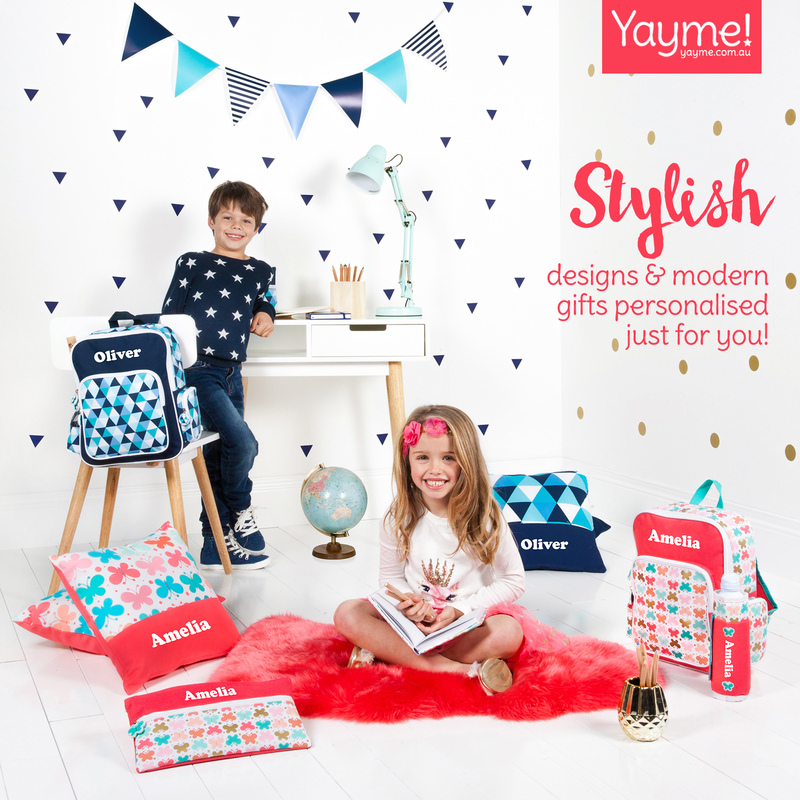 Be sure to check out the designer children’s clothing and school bags that start from a measly $2000! Dotonbori is a tourist hot spot mostly known for its undercover arcades full of shops and food stalls. Look out for the Glico Marathon Man, which is the most photographed sign in Osaka. Glico is a Japanese confectionary brand I grew up with, you may have heard of their most famous snack, Pocky! You can take a cruise down the river, a ride on the Don Quixote Ferris wheel, which scared me but not my three-year-old. Eat Japanese street food like delicious Takoyaki (octopus balls) and aimlessly wander the arcades shopping. Your kids will love spotting the giant crab and octopus statues high up on every street. There are pet shops selling the cutest designer dogs any toddler has ever seen. Hundreds of costume shops for said dogs …and kids too. My daughter couldn’t get enough of the laneways and was surprisingly not overwhelmed with the bustling activity. On our first full day in Japan, we went to Kids Plaza. I cannot recommend this place enough, and I wish we had more of this in Australia. It’s essentially an educational play centre for kids with everything under one roof. Be prepared to stay the entire day. You can come and go via level three so if one parent needs a shopping break…….you’re sorted! Inside you’ll find everything from a play ‘grown-up” world where your kids can be firefighters, do the grocery shopping, work at the salon or deliver the post, which my daughter found thrilling! Head to the TV studio and read the news. 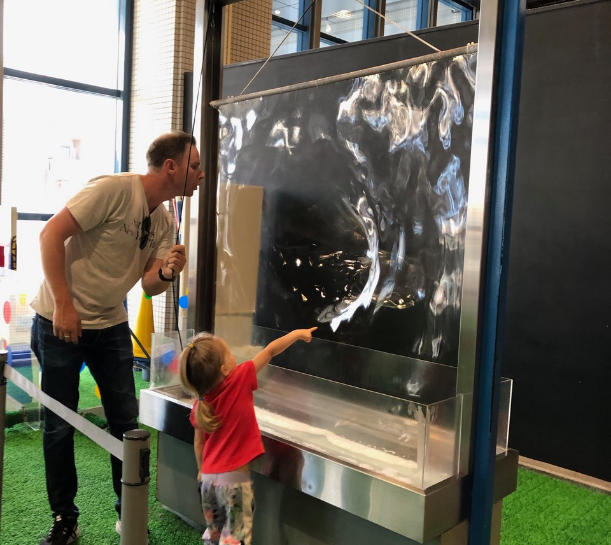 Play in the science hall making giant bubbles or learn musical instruments. Experience cultures from around the world, cook pizza, balance on bridges, it’s never-ending and kids of all ages were having fun! My daughter still talks about it! You don’t have to book ahead or come in certain time slots, you just play as you like. The facilities here are very family friendly, vending machines with healthy-ish snacks for children, kids’ toilets, and even a bathing area in case your bub has some kind of explosion of the brown variety! If your kids have even more energy to burn, Ogimachi Park is right next door. It truly is a playground on steroids, with a climbing wall and swimming pool included. Thankfully my littlie was too tuckered out to tackle this one but it’s certainly worth a separate visit. We ate lunch nearby at an Okonomiyaki (make your own savoury pancake) restaurant. It’s a bit scary sitting at a hot plate table with a toddler but they soon learn not to touch and my daughter loved the DIY cooking! Japan is fast figuring out that smoking around food is not on, but some restaurants still allow it. 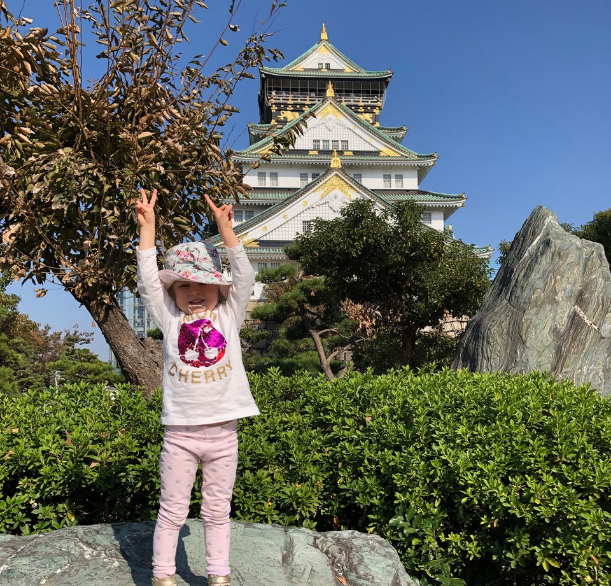 After a full day dedicated to toddler play, I decided we needed a little serenity so we headed to Osaka Castle. Hidden in a beautiful big garden you can spend the whole day exploring here. We started at the Morinomiya entrance so I could lure my daughter in via the kids’ playground where a super long super fun roller slide exists and TOILETS! After enough park play, we took a mini train ride to the castle but a walk with kids is doable in about 20 minutes. Autumn is a fabulous time in Osaka and in most of Japan. The weather is comfortable, the trees are a beautiful orange hue, yet you don’t get the crowds that Cherry Blossom season brings. There are plenty of perfect photo opportunities at the castle. At the base, there are cafes, shops and sometimes buskers. You can head to the top but it’s an extra cost and I knew I’d be piggybacking a toddler too so I figured …we’d already seen Elsa’s castle, we didn’t need to see another. 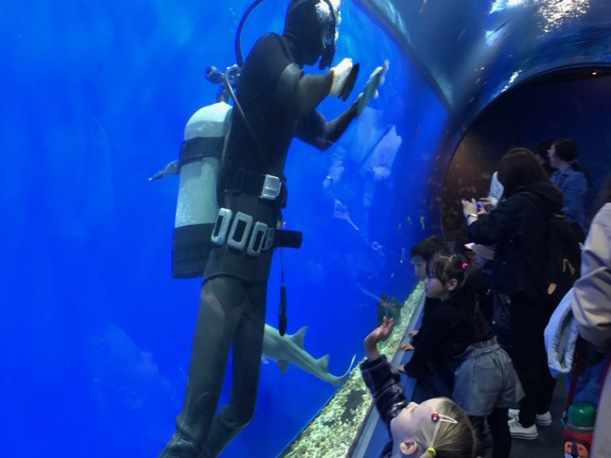 I love a good aquarium and Osaka is home to Kaiyukan, one of the best in the world. What’s cool about this place is the innovative spiral design, which lets you see multiple angles of the same tank. So when it gets busy in one spot, which it does, you just mosey on down and view the exhibit from below. We were able to see feeding time for the huge whale shark, crowd-free. But our favourite exhibition was the Jelly Fish display. Watching them bobbing up and down was mesmerizing. I noticed most kids were infatuated with the jellyfish too, plus Nemo and the mini eels! 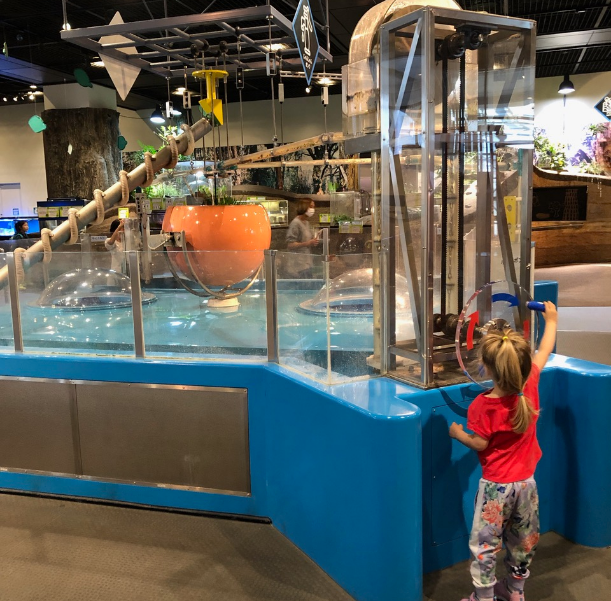 We could have spent longer at the Aquarium or headed next door to Legoland, the giant Ferris wheel or the shopping mall but…toddler! Most days we kept it to one main adventure, I think that’s enough for little ones when you’re in an exciting big city. There are many transportation options between Osaka and Tokyo but the bullet train (shinkansen in Japanese) is by far the easiest and pretty fun too. The Nozomi train is the fastest route, 2 hours and 30 minutes and bam you’re in the heart of Tokyo. This is the most expensive option followed by the Hikari and then the Kodama train, which takes around four hours. But with a three-year-old, high energy toddler the fastest option is the only option! Before we boarded we allowed extra time at Shin-Osaka JR station, not only to negotiate our way there via subway with loads of luggage plus a straggling toddler but also so we could load up on goodies from the Ekiben (train station food stalls). You can pick yourself up a few snacks and drinks on the train, like a glass of vino, but browsing through the station shops is an eye-opener. I even spotted some gourmet animal snacks for your four-legged fur friends. The best part of the shinkansen is watching it arrive and depart. The precision of Japanese trains is perfection. They are rarely early or late. They are on time. If you can go to a station that the bullet train doesn’t stop at then this is where you’ll get a sense of how fast they really are, just hang on to your kidlets! A lot of people wonder where to store their embarrassingly oversized suitcases, not to mention added children items, I’m not going to lie, it can be a squeeze. There is a space behind the last row in each carriage but if you can’t store them there, like us, you’ll have to reach up high and store them on the shelf above the seat. Trust me our suitcases are enormous but we managed to get them all up there. 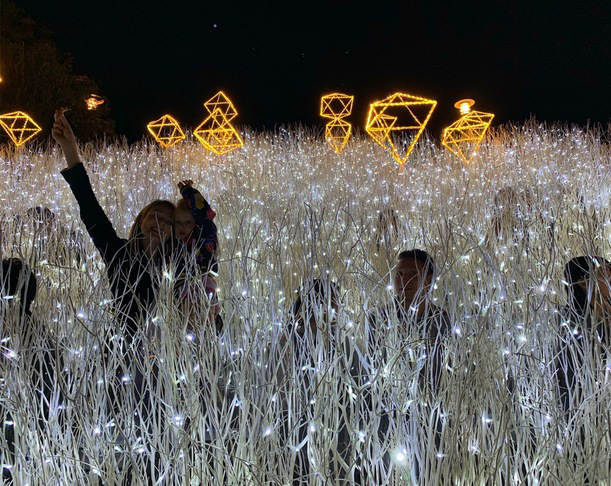 Hence the ride to Tokyo was relaxing, we sat back (with a glass of wine) watched the world whiz by and prepared for the bright lights and the electrifying city of Tokyo! Ramen factory …every child and uni student’s favourite snack right? SpaWorld…a little taste of the onsen life, and for kids too!